He’s so excited and he just can’t hide it. 8 Responses to He’s so excited and he just can’t hide it. I’m more concerned with why the woman has a mustache. I can’t believe I missed that! 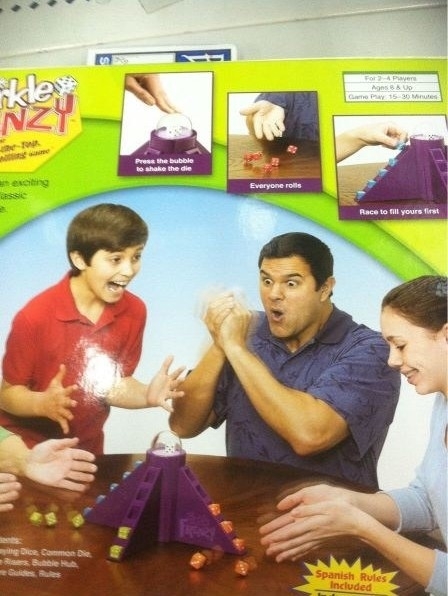 That kid’s Dad looks more like the type who would be rolling dice in a floating crap game than trying to fill up some toy at home. If I was in that crap game, I think I’d let him win! Y’know, fear and whatnot! Is that some space orb on his chest? Is he being greeted by the Cloud Of Utter Excitement? It looks like the Physical Body of Excitement and it looks like it’s not going anywhere near the girl! It’s the Spanish rules included, right? I’m so right, aren’t I? Si Señorita, tienes razón! Muy buena!